The open adoption process is one that holds great joy for many families while seeming to also produce a number of negative experiences. While many prospective parents eagerly await the big day where they can welcome a new miracle into their family, most often do not consider the complexity of the long-term changes that comes with it. Our adoption center is here to offer adoptive parent and birth mother help every step of the way to make the entire adoption process simpler and less stressful. A is 4 Adoption works to improve the structure set by your typical adoption agency in CA. Private adoption can be a complex process, which is why our experts are here to create a custom-tailored plan to provide the best possible outcome for the child. When adopting a child, it can be hard to think about the long-term changes that you can possibly benefit from in the future. Today, we’ll look at a few important factors that moms have come to realize as they grow and mature with their expanded family. These realizations may help to illuminate your future as an adoptive parent. After adopting a baby, family members will begin to get into a routine to normalize their daily lives. This means that your extended family is fairly unique, yet they feel like a normal group of individuals. Oftentimes, adoptive parents will seek out other families that have benefitted from the miracle of adoption. Spending time with other adoptive families will be beneficial for your child in that they see that other children have a similar upbringing, making it a less strange concept. You as the parents can also discuss your triumphs and challenges or “compare notes.” The benefits of hanging out with other adoptive families makes the process well worth the effort, and chances are that you’ll be on the lookout for these families in the future. Many times, parents who are adopting a child expect the excitement to die down over the years. Once everyone gets settled in, a normal routine will ensue that minimizes any talk or thought concerning adoption. A is 4 Adoption has heard many times that the opposite of this is actually the case. Adoptive parents will often find that they are thinking and talking about their child and adoption on a daily basis. While domestic adoption does come with the standard fears and concerns, you as a veteran of experience will no doubt want to openly talk about it with everyone. Often, families who are open and honest about their adoption will naturally tend to create an air of ease and comfort surrounding the subject. Your child may actively bring it up to ask questions or express concerns, and you as the parent will have the chance to answer questions and offer guidance along the way. Becoming a parent through adoption can be an amazing experience with numerous joys and challenges. Many times, people who decide to adopt are not fully aware of the intricacies surrounding adoption until they are well into the parenting stage. 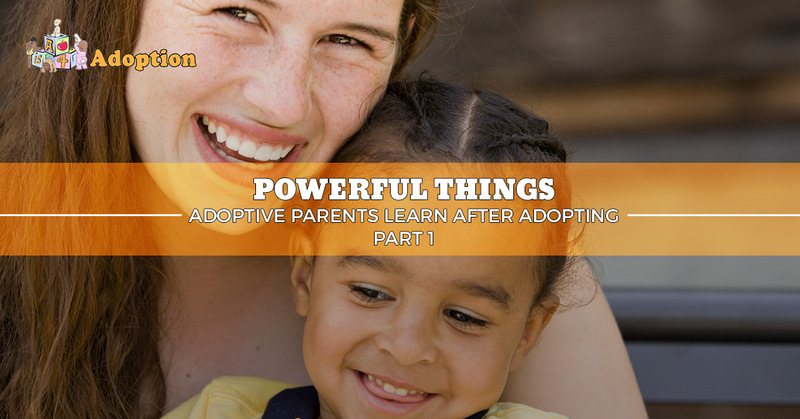 Next time, we’ll look at a couple more amazing lessons that new parents can learn about with their adopted children. No matter the reason why you choose to adopt, stepping out of your comfort zone and raising a child can be an amazing experience for all parties involved. If you and your family are considering a miraculous addition, A is 4 Adoption can help! Our adoption center aims to cut through the inefficiencies of any adoption agency, from California to New York. By offering top-quality support services for both the birthmother and adoptive parents, our organization is able to create a positive environment in which a child can begin their lives. Contact us today to learn more about our quality adoption process!